How to Locate scanost and Execute OST file recovery? Microsoft enables Outlook users to store Offline data temporarily on hard drive in the form of OST files during the absence of Exchange Server. These temporary files get automatically synchronized with the previous data files once Exchange Server and MS Outlook reconnect. However, due to the occurrence of synchronization error these files may not update automatically. Perceiving the probability of synchronization error, Microsoft provided OST integrity Check tool named Scanost.exe, which detects and repairs this particular issue. To utilize this inbuilt tool, user must be connected to Exchange Server, as it cannot run offline. However, one also got to make a note that its location in Windows OS depends on the Outlook version utilized by user. It varies from version to version. STEP 1: After launching the application, Inbox Repair Tool window will display on user’s screen listing Outlook profiles created by user. STEP 2: Select the particular profile that carries corrupted OST file. STEP 3: Now, OST integrity check window will appear asking user to choose the folders or files to be scanned. Select the required folders. STEP 4: Check the Repair errors checkbox below the window to repair the selected files and folders. STEP 5: Click the Begin Scan button to initiate scanning of chosen OST files. To resolve aforementioned cases Microsoft expert advice utilizing professional Kernel for OST to PST tool. While choosing external source user must test its credibility by utilizing its trial version as it would help user in better decision-making. 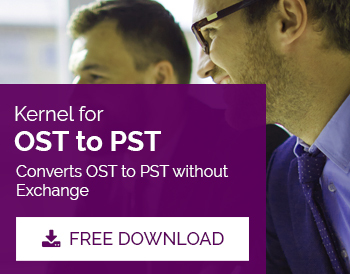 These third party tools convert corrupted OST files in PST format to obtain the lost data. How to Import PST File in Outlook? How to Configure Outlook 2007 in Office 365? How to Change OST File Location? How to Remove Password from PST File? How to Locate Scan PST?